Been looking in for a while but feel now is the time to jump in. Love blues, and in January bought a Sheraton which I have restored and want to learn some blues licks. I have played an acoustic and can play a couple of Dylan and Morrison tunes but never concentrated on blues, which is what I want to dedicate 95% of my guitar time to now. So, what I looking for is a mentor, or mentors, that can show me a few things, get a few tips, and try those out on my beloved Sheraton. So, if anyone has any fancy licks in the key of A to point me at that would be a good start. Love discussing blues as well and this seems the place to do that. Another old dog here that took up guitar again after a 30 year hiatus. I'm in the country stuck on dial up so youtube is out. DVD's became my friend. Thanks birddog yes got a few DVD's but great to get tips and clues from similar inclined folk as well. Yes, seems like a good place to hang out. Rico, nice hat, I have one similar to that. As for guitars, yep, I own Epiphones, Agiles, Rogues, etc. If you ask nicely, I'll show you a picture of my Johnson. Careful, We know what comes up when you google "Rico's Johnson" its legendary status has been talked about before. Oh, nice guitar Sheraton. Any Pics of the brown one ? Would love a guitar with a Tone Spectrum or original New York humbuckers....you are a lucky guy. 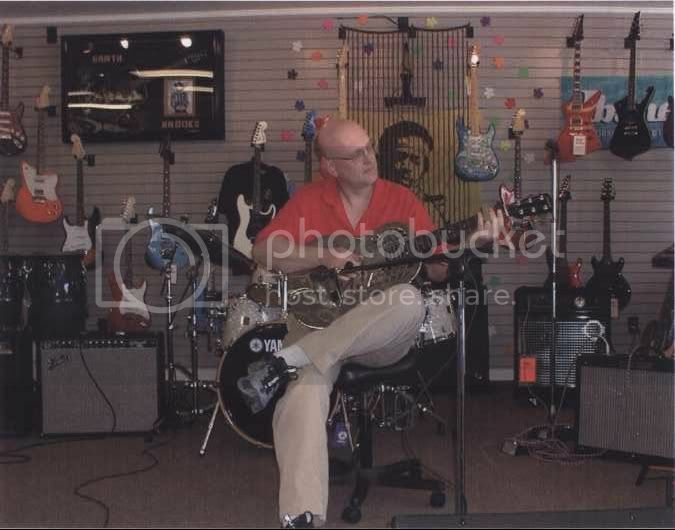 This is my baby 1987 Korean Epiphone Sheraton, the photo is when I bought it. Has a new harness and pickups, since then, and I can split the pickups, and put them out of phase, if I wish, on push pulls,...It looks different now, as I have changed the knobs and pickguard since, will take some more pictures soon and post them. I've been told he has a nice stiff pick too.